Detroit just hosted the largest public satanist ceremony with 600 people. The "largest public satanic ceremony in history" took place Saturday in Detroit, a city that has the largest and oldest chapter of a national Satanist organization. The group unveiled a nearly 9-foot tall bronze statue of a goat-headed Baphomet in a private ceremony attended by 600 ticket holders, Lucien Graves, co-founder of the national Satanic Temple organization in Boston told ABC News. The Satanic Temple in Detroit has more than 200 registered members. "They are so active and well-organized," Graves told ABC News. "There's probably been another wave of interest since this event." The Detroit chapter is the first of the national organization, Graves said. He credits the Detroit chapter's founder Jex Blackmore with the growth of the chapter since it was established there in August 2014. "It's more or less because of her. She was just a very confident person who started working with us," Graves told ABC News. The pair met in Boston and then she moved to Detroit and set up a chapter there. Blackmore told ABC News it is largest chapter. "I think the Temple appeals to the radical, politically-charged spirit of the city and many are drawn to us as a force of positive, effective change in this community," Blackmore told ABC News. 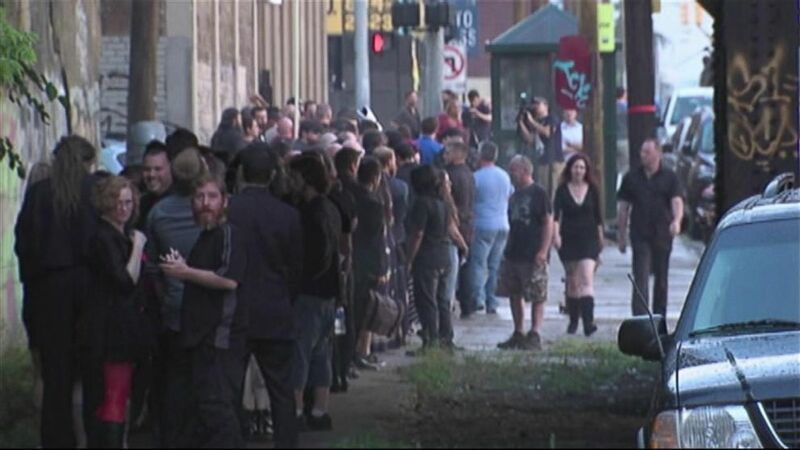 (WXYZ) The scene outside the unveiling event organized by the Detroit Satanic Temple, July 25, 2015. The statue was originally planned to sit at the Oklahoma state capitol, but the state's supreme court banned all religious displays there, including the Ten Commandments. The statue was created through $28,180 fund-raised by 1,041 people on Indiegogo.com last year. The fundraising page said the statue's purpose was to contrast the Ten Commandments monument that was previously on display. Greaves said there are 20 chapters across the country with about 20,000 members as a whole. Tickets for Saturday's event were $25 and the location was revealed only to ticket-holders, ABC affiliate in Detroit WXYZ reported. Meanwhile, Christians in Detroit protested the event nearby. The event served "as a call-to-arms from which we’ll kick off our largest fight to date in the name of individual rights to free exercise against self-serving theocrats," according to the invitation. "People are trying to push religious agenda, whether it’s part of the public opinion or not," Greaves said. "Groups will take it as slander against them and it’s just not the case. We don’t really care if they’re offended or not." Baphomet was chosen for the statue because of the contemporary recognition of it as a satanic figure and it illustrates the “reconciliation of opposites,” Blackmore said. (WXYZ) A crowd gathers and waits to participate in the unveiling event of a statue depicting Satan, July 25, 2015, organized by the Detroit Temple of Satan. According to its mission statement, the national organization, The Satanic Temple, "facilitates the communication and mobilization of politically aware Satanists, secularists, and advocates for individual liberty." Among the causes it supports are gay marriage, reproductive rights and eliminating corporal punishment in schools. The national organization does "not promote a belief in a personal Satan." "To embrace the name Satan is to embrace rational inquiry removed from supernaturalism and archaic tradition-based superstitions," the FAQ of TheSatanicTemple.com indicates.